Tanjung Rhu Resort is a luxury accommodation at the northernmost tip of Langkawi island, Malaysia. The area has one of Langkawi’s best shorelines, and is home to various nature attractions, including mangroves, clear waterways, limestone crags, as well as uninhibited islands. The resort itself is nestled in the cool shade of rustling pokok rhu (Casuarina trees). The logo created for the resort is a composite of all the environmental elements. The marketing collaterals are also designed to highlight these natural attractions. 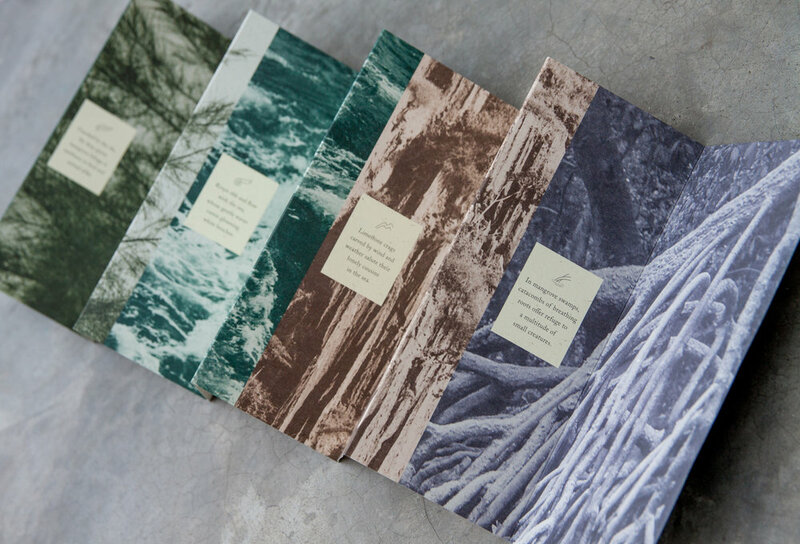 Tanjung Rhu’s visual identity, collaterals and advertising highlighted the unique convergence of the four geographical features of the resort’s immediate surroundings. THE MANGROVE / In mangrove swamps, catacombs of breathing roots offer refuge to a multitude of small creatures. THE LIMESTONE RIDGE / Limestone crags carved by wind and weather salute their lonely cousins in the sea. THE RIVER & THE SEA / Rivers ebb and flow with the sea, whose gentle waves caress gleaming white beaches. THE RHU (PINE TREES) / Guarded by the rhu, the deep green mangrove foliage is sanctuary to bird and animal alike.